3Advance Ranked Top Washington DC Mobile App Developer! At 3Advance, our focus has always been our clients and the experience they provide. When their users are happy, our clients thrive, and as such, so do we (Three Advance, after all, right?). This is why it makes us so proud to read our reviews over on Clutch, a global ratings and reviews site: We’re the only agency in DC’s Top firms to have a PERFECT 5.0 score based on multiple reviews from the people we serve. UPDATE – JANUARY 1ST 2019: 3Advance had maintained it’s 5.0 score with additional personal client reviews. We were also now included in the Global 500 B2B digital agencies. In the past week, Clutch released their 2018 report on the Top Agencies and Developers across the globe. 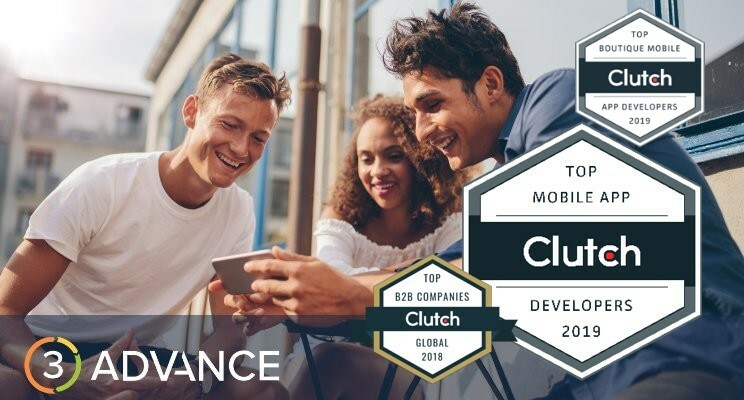 It makes us so proud to be recognized here on Clutch as one of DC’s Top Mobile App Developers – and one of the only firms actually headquartered downtown. Clutch’s research covers thousands of mobile app an web development companies around the world. Their research methodology evaluates companies on several quantitative and qualitative factors, including their market presence, client list, and more. Most importantly, Clutch analysts speak first-hand with clients to see how each firm performs, creating full-length reviews and case studies for each company’s Clutch profile. So if you haven’t met us yet – well, even if you have, friend – reach out and say hi! Let us know how we can help you advance. And of course, come visit us at our sparkly new office space next month in Farragut Square – we’re moving literally next door. Finally, and truly, thank you so much to Aaron (HSA Coach), Cindy (NNEDV), James (Teambuildr), Dan (Fanamana) and Gregg (RCFP) for their flattering comments, and their continued business. Check out case-studies of these, and our other work at 3Advance.com. Paul Murphy is CEO at 3Advance. Paul is a passionate, design-minded leader and entrepreneur. He has been developing apps since they were pages on the Information Superhighway. SInce founding 3Advance in 2010, Paul has led successful projects with NPR, Special Olympics and a host of DC startups. Rapid Application Development for a Timely Two-sided Marketplace. Pay It Furloughed: A RAD effort to support our local community. Mobile App Prototypes – for Product Validation, Fundraising, etc. Sign up to Newsletter to get latest insights and news from the 3A team.